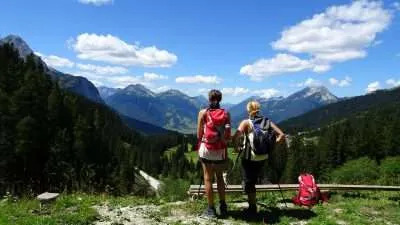 Our walking holidays in Germany offer some truly breathtaking scenery and a chance to experience the best of European hiking. The Elbe Sandstone Mountains are one of the most beautiful regions in Germany, located just a few miles from Dresden. In 2006 the 115-kilometre long Painter’s Path (Malerweg) had been inaugurated. This is a moderate to strenuous trek, appropriate for experienced hikers, which takes in the entire Malerweg Trail in just 8 days. Where Do our Walking Holidays in Germany Take Place? The Bavarian Alps section of the Way of St James offers unspoilt nature, quiet villages and immersive experiences. Hike from Garmisch Partenkirchen in Bavaria across two mountain ranges of exceptional beauty and untouched wilderness to the Austrian host of the Winter Olympics, Innsbruck. Or take in the beautiful valleys around Mount Zugspitze on a leisurely circular walk. The Elbe Sandstone Mountains are one of the most beautiful regions in Germany, located just a few miles from Dresden. They were named by two Swiss painters who were impressed by the similarity of the area to the landscapes of their own country. You will see bizarre rock formations, walk through ancient woods and picturesque valleys alongside the winding Elbe River.